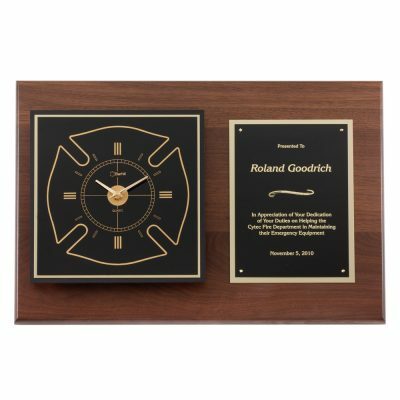 This 18” wide x 12” Tall Walnut Fire Plaque with Maltese Quartz Clock features a mounted quartz clock and large black nameplate. Basic artwork and text is imprinted on the nameplate in gold to match the clock, for a truly classy look. Price includes item, nameplate and basic artwork and text on plaque. This award makes a great fire anniversary or fire retirement award.